The $300 price range is where you will start seeing a real improvement in both transparency and overall tone quality. Even though some of these speakers might seem similar to those found in the $200 segment of the market, there’s a significant difference. Today we’ve prepared some of the best monitor speakers under $300 for you to check out. The models listed below include some of the proven veterans of this segment, as well as some new arrivals that have a lot to offer. If you’re looking for a reasonably good performance on a budget, you’re in the right place. The reality of modern music production is that sometimes you have to get some work done on the go. This usually means that your home setup is not available and you need more mobile solutions. 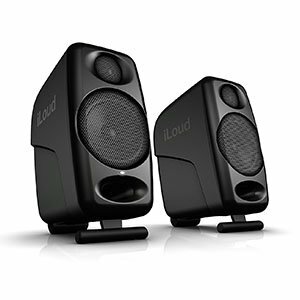 In that respect, IK Multimedia iLoud Micro Monitors present one of the best solutions you can get. Designed with mobility in mind, these speakers are aimed at traveling producers. The design of the cabinets is centered around portability, which is apparent from their light weight and the fact that they are pretty compact. The performance is ensured by a 50 Watt Class D amplifier that powers two sets of low frequency drivers and pretty capable tweeters. Overall frequency range available spans from 45Hz to 20kHz, making these quite effective considering their purpose. Eris series from PreSonus is one of the more exciting lineups if you are looking for good bang for the buck ratio. There are several reasons why PreSonus Eris E5 are so popular and it all starts with the cabinet design. We have a quality build that features front firing horizontal ports which allow you to place the speakers a bit closer to the walls. Despite what the name might suggest, Eris E5 packs 5.25″ Kevlar low frequency transducers paired with a set of 1″ low mass silk dome tweeters. This entire setup is bi-amped and packs some 70 Watts through the respective Class A/B amps. Add to that a set of rather capable acoustic controls, and you have a very impressive setup for home studio use. It is no secret that JBL is one of the best names in speakers industry. However, when you take their experience, expertise, hunch for innovation and apply it to studio monitoring speakers, you get something truly extraordinary. 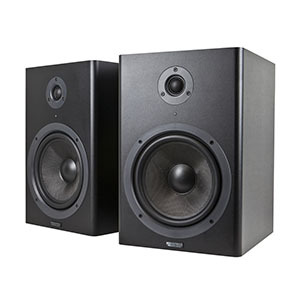 JBL LSR305 have proven to one of the best monitors in their specific category and probably beyond. Simple in nature, these speakers are capable of great performance. Design of the cabs makes the LSR305 look bland on a first glance. However, a closer look at the baffle reveals a very carefully designed waveguide that really improves the overall fidelity of the speakers. In addition to the crystal clear 1″ tweeters, we also have a pair of 5″ low frequency drivers to fill out the bottom end. JBL has found the perfect balance. Despite the fact that Monoprice doesn’t enjoy the same level of confidence as some other brands on our list, they have managed to nail a great setup for those who need a serious, budget friendly solution. Monoprice Stage Right 8 Inch brings an abundance of power and lower end extension at a price that is almost too good to be true. 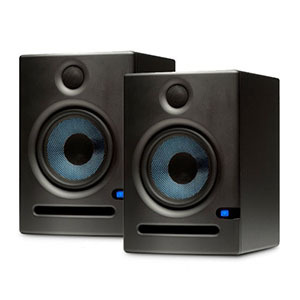 These speakers feature a quality made but ultimately simple cabinet which is very streamlined. The 1.25″ silk dome tweeter comes across as very flat although with a tangible improvement in terms of range. Same goes for the massive 8″ low frequency driver sitting below. In terms of power, you are looking at a bi-amped 120 Watts per channel, which leaves plenty of head room. If there is one model of monitors that have really proven to be the low risk, high performance deal, it is KRK Rokit 5 series. The latest, third generation further irons out whatever kinks were there in the original design, pushing these monitors to a much higher level. KRK has decided to keep the same aesthetics which is good considering it has become a trademark. On the hardware side of things we have a extended range soft dome tweeter paired with a 5″ low frequency driver. Both of these run off a dedicated amp and feature great frequency separation. In terms of transparency, KRK Rokit 5 Gen 3 has once again proven that it is among the very best. Needless to say, it’s one of the best beginner options. Optimal performance is hard to dial in, especially in the lower mid range. However, it isn’t impossible. Case in point, M-Audio BX5 Carbon. This speaker pushes itself to the very edge of efficiency at power levels which make it hard to reach the clipping territory. With a simple, stealthy design, BX5 Carbon is bound to fit in into any environment. Glance under the hood reveals a 5″ woven Kevlar low frequency driver paired with 1″ soft dome tweeter. Both transducers run a dedicated amp. You are getting 40 Watts on the LF driver along with a 30 Watts on the tweeter. Transparency is more than good while advanced acoustic controls make it easy to dial in a good setting in any studio. What To Expect From $300 Monitor Speakers? There are several distinctive attributes that are inherent for this segment of the market. First and foremost, you are most exclusively dealing with 5″ drivers of various power. For the most part, a transducer of this size is going to be more than enough for home studio use. This is also why most of the beginner and budget users go for a speaker in this price range, leaving the stuff in the $500 bracket to a more professional crowd. With that said, the monitors you can get for 300 dollars are far from bad. 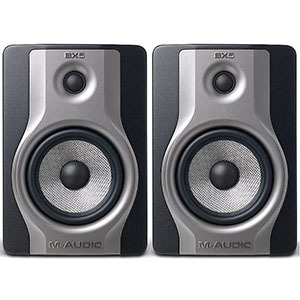 As a matter of fact, some of them are easily among the best monitor speakers on the market. Choosing the right set comes down to knowing the space you will be working in. Most of these speakers come with some sort of acoustic space control. Some will have a more elaborate system in place, while others not so much. Either way, you will definitely have some options in this regard. The next big thing is the waveguides department and frequency response. Some speakers, such as the JBL’s LSR305, come with rather advanced waveguides that do a lot in terms of dispersion control. Brands are generally trying to balance out price and performance in this segment, giving you a bit more refined output. Most of the speakers found here are going to have a relatively flat and transparent response. As you probably know by now, this is exactly what you want to have as a music producer. Unfortunately, that mostly applies to mids and trebles as the lower end of the frequency range is still a bit unstable due to 5″ drivers. On top of that, you have rear facing ports on most models, which require you to apply some caution whenpositioning the speakers. The best way to find a good solution in the $300 range is to start with the power output you think will be comfortable for your needs. This metric varies quite a bit as different brand consider overall power output to be more or less important. A good way to go about this is to stick with proven models as they are usually improved every year or so. There is a reason why $300 monitors are usually considered to be the sweet spot for most beginner and intermediate users. To put it into simple terms, you are getting an optimal combination of performance and features at a price that is still very much attainable for most. However, this doesn’t mean much to someone who is just starting out. Because of that, we have to go a bit deeper into this subject. Getting a $300 set of monitors opens a few doors to you which aren’t all that common in the price ranges below this one. For starters we have a better complement of transducers. When we say better, we mean that in terms of both size and their default performance. Amplification is also better with more refined amps delivering a manageable amount of power. Last but not least we have more complex I/O clusters as well as better designed acoustic controls. We always say that monitor speakers should match the size of the studio you are working in. However that leaves quite a bit of freedom for different brands to showcase their own designs. Transducers in this particular price range usually range anywhere from 5″ to 8″ for the low frequency set, while tweeters go up to 1.25″. What matters more is the fact that some of these transducers are really impressive in terms of materials used and how everything fits together. Amps are by far one of the most important components on any set of speakers. The way an amp delivers a signal to the speaker, and its nominal power can determine how much transparency you will get on your end. When you shop for $300 monitors, you are already walking into proper bi-amped setups with plenty of juice to drive the entire marketed frequency range. You will very rarely run into peaking problems or anything of that kind. More often than not, the speakers in this price range will offer plenty of head room to work with. Advanced features that become available in this price range are mostly limited to expanded I/O clusters as well as more refined acoustic controls. Even though there are plenty of users who are quick to disregard both of these things, we can’t stress enough how important a good acoustic room control can be. It is no secret that speaker positioning and setting up is at least half of the work when it comes to setting up an efficient studio environment. By having good acoustic controls on your side, you can really fine tune the performance of the speakers to your particular room shape as well as size. I/O clusters are also important. We are talking compatibility with different equipment but also the ability to move your monitors from one setup to another. Most beginner producers work on laptops but that isn’t always the case. Chances are you will want to route your setup through a different set of gear, maybe something more serious and professional. The $300 price range is where some of the best bang-for-the-buck monitor speakers can be found. The ones we’ve included on this list are just the tip of the iceberg, but also some of the best you can get at the moment. 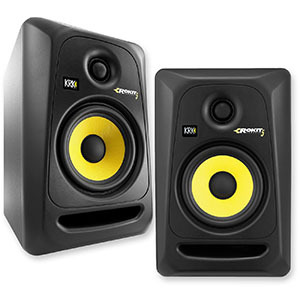 Compared to cheaper models, a $300 set of monitors will give you much more control over your sound. On top of that, the boost in performance is just too significant to ignore. 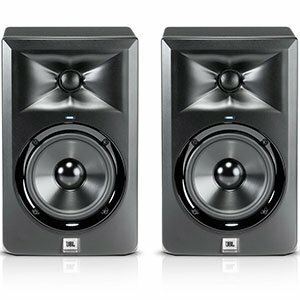 If you’re a casual user or an aspiring professional, these monitor speakers will give you the performance you need to properly mix music.